The Darth Vader in the way of increased and sustainable momentum in your business is change fatigue. The first step to overcoming this is fully bringing your humanity to your work. Read more about this in part one here. The second step is to fully understand what actually causes stress and then act accordingly. In the game of cricket an astonishing number of batsman get out just before reaching the coveted milestone of making 100 runs. A key reason is that they start thinking about being there rather than playing the next ball on it's merits. Professional speakers plan and rehearse so diligently we're able to be in the moment with the audience. We call it 'planned spontaneity'. 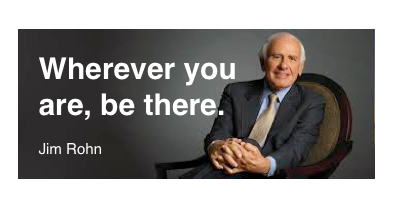 I was very fortunate in the mid 90's to spend a few hours in conversation with three other people and the legendary speaker Jim Rohn. My enduring memory - Jim's ability and willingness to be fully present in the moment. 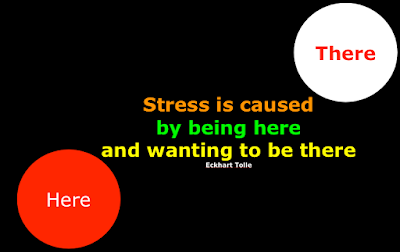 Astute leaders are crystal clear on where they're going, yet highly disciplined to live, and to be with people, in the moment. You?